Nervi is the oldest surviving winery in Gattinara, established in 1906 when Italo Nervi was able to buy land cheaply in the area, after devastating hailstorms the previous year had pushed the region into economic hardship. Today it comprises 28Ha – out of around 100Ha in the entire Gattinara denomination – making it a major player as well as a long-standing one. Its recent history has also been marked by economic distress. When the last Nervi owner died in 1975, the family company went to employee-ownership until sale to an industrial group in 1990. By 2011, the business was struggling and was again put up for sale, with Norwegian businessman, Erling Astrup, buying and running the estate with his wife Katherine. Astrup had come across Nervi in 1995, while studying at Bocconi Business School in Milan. When the distressed-sale came up, he was tempted. But he first asked for an expert’s perspective, and consulted friend and leading-light in Barolo, Roberto Conterno. Conterno confirmed the quality potential of the estate’s vineyards and Astrup went ahead. But by 2018, Astrup and his investors were themselves ready to sell and Conterno was well-placed to step in. For €5M, Conterno acquired 90% of the business, which gets him 28Ha of high quality Gattinara for a price not dissimilar to buying 1Ha of prime Barolo cru. That seems like a pretty good deal, particularly at a time when Gattinara seems to be getting a bit more visibility in the wine world. Gattinara is mainly old volcanic soils including porphyry with high Iron and Manganese content, that retains extra acidity well. Nervi’s Valferrano vineyard, as the name suggests, is just such a site, with iron-rich porphyry. The Valferrano 2013 we tasted was very fine and convincing. Gattinara is cooler and more Alpine-influenced than the Langhe, with around twice the rainfall – c. 1,400mm mainly in Spring and Autumn. This relative coolness may well explain the poise and balance on their other cru Gattinara Molsino 2009, where the heat of the vintage was balanced by Gattinara’s natural freshness. Either way, this was their finest wine that we tasted. 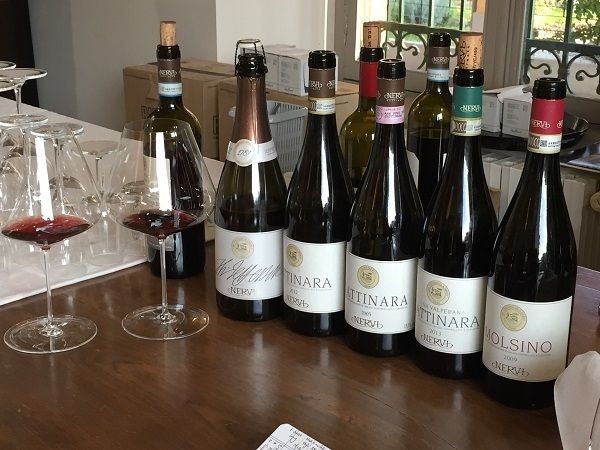 The wines we tasted were all at their tasting room at the Southern end of Gattinara’s main street, which we stumbled upon taking a walk through the town without any prior bookings or expectations. We nevertheless were able to taste through most of their range, with their very helpful tasting room manager, who broke out the good glassware for us. Those included an Erbaluce di Caluso and a long barrique-aged Erbaluce di Caluso Passito 2005 equivalent, both using bought-in grapes, as well as an intriguing sparkling Nebbiolo rosato, named Thomas Jefferson 1787, in honour of Jefferson’s commentary on the wines of Gattinara. Tasting both the straight 2012 and 2005 Nervi Gattinara also confirmed longevity on their Nebbiolo wines. Old clone Erbaluce found and 1,000 plants trained to Guyot, as opposed to the traditional pergola. Wine selected and bought-in by Nervi, then bottled and sold. Base vintage 2014. First bottle lightly corked, so 2nd bottle opened. 1,200 bottles / year. 28 months on lees. Easy-drinking Nebbiolo blend, now 60% Barbera, 40% Nebbiolo, having previously experimented with Pinot Noir, Lagrein and other varieties as softening blending partner. 1 year in stainless steel with no wood. Buy grapes from the other side of the Sesia river. 3 years in 1,000-7,600L large, old Swiss, Austrian and Vosges oak. South-west facing valley. High Iron content from porphyry. Selected from Cieck winery, in San Giorgio. Aged in barriques and only just bottled. The name of the variety, Erbaluce, is allegedly derived from Alba Lux (dawn light). 15.5% ABV.